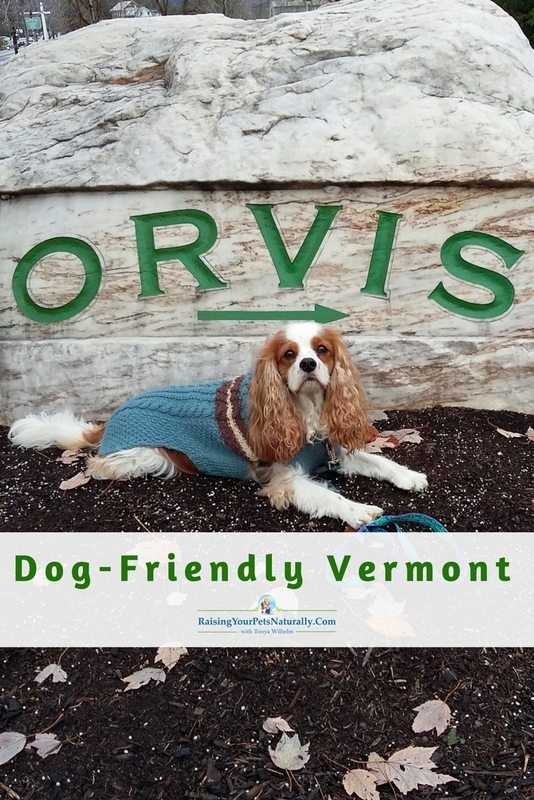 Dexter The Dog and I love visiting dog-friendly stores and we love our outdoor adventures, so the Orvis Retail Store in Manchester, Vermont was a must-see. After all, it is the Orvis flagship store. 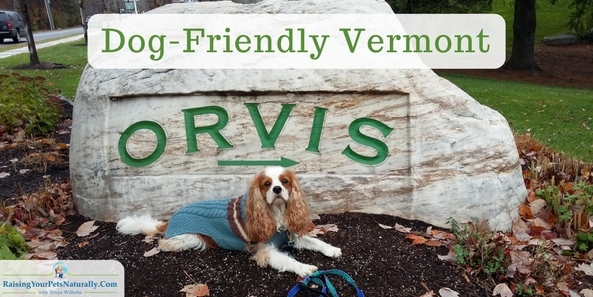 We enjoyed exploring the dog-friendly Orvis store. The employees were so nice and friendly. 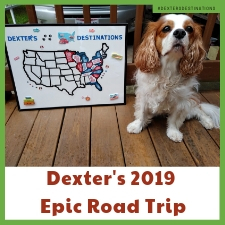 It seemed that Dexter The Dog and his friend Levi were a hit. Employees and guests came up to us to say hello. Orvis is known for their fly-fishing gear and Dexter and I snooped around at all their displays. My step-dad is a fly fisherman and I knew he would have loved all that Orvis had to offer. They even had a neat bulk fly fishing section where you can purchase and make your own flies. To top it off, Orvis offers FREE fly fishing classes. Yes, I’m thinking Vermont may need to be a do-over with my step-dad and Mom. After Dexter, Levi, Chris and I toured the inside of Orvis, we headed to the outside. It was time to see the trout pond that doubles as a hands-on experience during the fly fishing classes. But before stepping out, we purchased a handful of trout food to feed the trout. Dexter was thrilled and excited to see the big trout coming up for the food. He really loves watching fish—he’s a fishing dog! After we had given the trout all of their food, we walked around the pond and even sat for a few moments on one of the many benches while we watched the families enjoying feeding the trout. 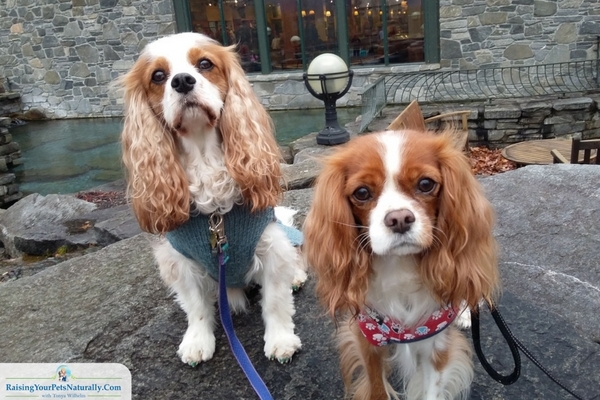 The Orvis flagship store is definitely a great place to stop on any dog-friendly vacation. 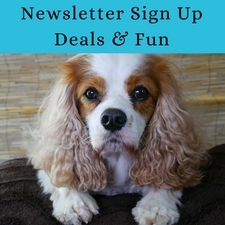 Don’t forget to bring some spending money, as Orvis sells a nice variety of dog supplies, including beds and collars. Do you take your pets to pet-friendly retail stores? Tell me in the comments. Love Orvis, and love that you and Dexter got to visit! We enjoy taking our pups to dog-friendly stores – lots of times they get good treats! 🙂 You are so right – bring your wallet, you just can’t say no to those beautiful puppy eyes! 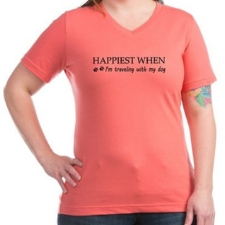 They offer so many great and quality products. Definitely a do-over stop! I just love how you licked your lips when looking at the fish at the start of the video! I think its great that stores are pet friendly. Glad you had a great time. haha Dexter likes to lick the fish too! I’ve never even heard of Orvis before this, but it looks like a really cool place to check out with the pups. We’ll definitely keep it in mind if we’re ever near one. Thanks! Oh, wow! A fantastic outdoor store and they also have an online store. As a native New Englander, I love your recent posts! I also love that I live in a very dog-friendly part of the US! That’s awesome. It really was a great extended weekend. I have to go back! I love it when businesses open their doors to pets! Orvis makes some great dog items too. They really do have quality items, including pet items. The beds were calling my name. If I had more room in my car….. I have never heard of Orvis but I’m all for supporting dog friendly businesses. The video is cute. Those fish looked like they wanted to visit with the pup. Great store. We were feeding the fish, they were very happy. I love that so many stores are opening their doors to dogs and even catering to them. That sounds like a wonderful adventure. I’m not sure I can think of a local pond that Dexter could see the fish. I’ll have to look, he loves fish! Not many pet-friendly stores around here but nobody in our family likes shopping anyway. So it’s all up to daddy. haha What town/area? Just curious. One day when I’m rich and famous I will visit Vermont! 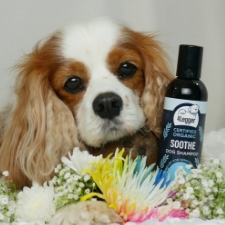 Knowing pet friendly places is great – it lifts a weight of a dog owners mind doesn’t it! I love seeing dogs while I’m shopping. The place we take our bottles to has a shop cat, and it is always a treat to see him. There aren’t many dog friendly places around here except PetSmart. That’s a shame. I’ve gotten into the habit of asking a store, even if they don’t promote being dog-friendly. If they are small, they usually say yes! Oh gosh, definitely adding the Orvis to my list! Can’t wait to take Ruby to Vermont one of these years. With the exception of pet stores, I don’t think she’s ever been to a dog friendly store. Oh, Ruby needs to check out some dog-friendly retail stores. She would be a hit! I think it’s great when retail stores are pet friendly. It gives us more opportunities for practicing good behavior in public! I wish I could take the girls with me when I travel or go out. 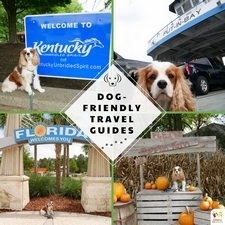 It’s important to know where dog-friendly or pet-friendly locations are. I’ve seen cats do well in strollers out and about. I haven’t really ever taken my dogs shopping other than to pet stores. We do have an Orvis not too far away, but we are rarely near it with the dogs! I wish I could take them more often, but I’ve gotten mixed messages from different retail stores (Home Depot, etc.). Sometimes they love does and sometimes they don’t! It’s always important to ask. When I asked our local Home Depot and Lowes if they were dog-friendly, they said no. But people bring them in thinking they are allowed, and staff are afraid to say anything worried that they may be service dogs. This is why I advocate always asking prior. In Portland, most of the stores that don’t sell food are dog-friendly. Especially if your pup is small and non-shedding and won’t knock things over! Someone told Mr. N he was the perfect store visiting dog. Way to go Mr. N! Portland…I still need to visit you. Love that they are pet-friendly. I have not seen their stores in or near Toronto. We only have a few stores Kilo could visit but Kilo only goes to pet retailers as he doesn’t love strangers and gets stressed. We sometimes do training in the parking lot of PetSmart to try to reduce this. That’s great you are working with Kilo and his anxiety. It can be a long haul. I’m taking my cat to a show in Burlington next month and trying to plan a few things to do on a tourist day on the way up and back. Most things seem aimed at outdoor adventures, not so great for January.